Ladies Gaelic Football Achievements: I need to go back through the archives but I have won various underage and adult county titles with my club. I represented my county for about 15 years. 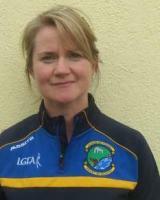 I have gone through the player pathway by becoming a referee and a tutor for the LGFA. Favourite Sporting Moment: Getting senior club ladies player last year when I had thought of retiring!! Biggest Disappointment: Loosing the All-Ireland Club Final in 2003! Most embarrassing moment on or off the football field: My football boot falling apart during the first half of the county club senior final last year. One rule you would change in our game: The kick out, the players to be outside the 20 metre line and 13 metres away before receiving the ball.